Heading back to Tucson, AZ this weekend, Aug 1-4, to attend The Pot Luck Audio Conference 2013. It's a gathering of the greatest minds in pro audio, well some great minds at any rate - even if they are being destroyed by beer. Peers, legends, up and coming and well established - they will all be there. I will be playing some guitar for the main event with dear friends, Devotchka drummer, Shawn King and Calexico's Sergio Mendoza. 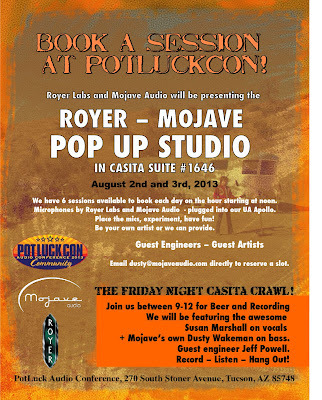 Plus I'll be sitting in at the Royer/Mojave microphone casita with vocalist Susan Marshall. Looking forward to seeing all the other engineers, producers, studio owners, audio equipment manufacturers and general audio geeks once again!